Thin Wrench - Less Than 1/8" Thick Maximum Torque not to exceed 35 Ft. Lbs. Some regulator and instrument manufacturers utilize a thin hex nut to lock components in place. These nuts are sometimes called "half" or "jam nuts". Standard wrenches are often too thick to capture these reduced thickness nuts. Enter Thin Wrench! This tool is machined from 10 gauge (about 1/8") 4130 steel with an Electroless Nickel finish. It incorporates a series of slots that are sized to fit both inch and metric hex jam nuts (top illustration). Inch sizes are 1/2", 9/16", 5/8", 11/16", and 3/4". Metric sizes are 13mm, 14mm, 15mm, 16mm, 17mm, and 19mm. The best approach, to using this wrench, is to clamp the Thin Wrench in a bench vice with the appropriate slot slightly exposed beyond the vice jaws. Slide the jam nut completely into the slot and use a standard wrench to loosen the full thickness nut. While the use of jam nut assemblies is not widespread, the Thin Wrench can come to the rescue when the problem arises. Limitations: This tool is not to be used as a substitute for standard wrenches. 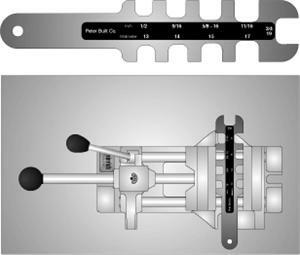 The thin profile reduces the strength of the tool. Torque values greater than 35 ft. lbs. will likely distort the wrench slot or round off the corners of the nut. If the jam nut assembly is corroded, it is best to presoak the assembly before attempting to disassemble the parts.